Living life in an RV 24/7 has its drawbacks, especially for a 9-year-old. June Bug Johnson has never gone to a real school, never made a real friend, never lived in a house without wheels. Still, she has her notebooks, her father, John, and, of course, Wal-Mart. Things could be worse. And soon they are. When June Bug sees her face on a "Missing Child" poster, she discovers that everything she's ever known is a big, fat lie. Her dad's the kindest man alive, so why is he lying to her? June Bug by Chris Fabry is the story of a little girl looking for the same big answers everyone seeks: Who am I? Where did I come from? Where am I going? Only in her case, the questions are very literal. The poster says she's Natalie Anne Edwards, her father calls her June Bug - who is she, really? June Bug knows from experience that asking her dad questions about the past is futile. So, she waits. And watches. And hopes. When a kind-hearted Wal-Mart employee offers the duo a place to stay until John can fix the RV, June Bug hopes they can stay forever. When John sets out across the country without her, she hopes he'll come back with answers. Although she enjoys life on the road, June Bug begins to crave the things she's never had - a permanent home, a mother, a friend. She hopes it will all work out. New discoveries in the case of one Natalie Anne Edwards lead John and June Bug back to where it all began - Dogwood, West Virginia. Here, a big-hearted sheriff won't rest until he finds out what happened to the little girl. A local thug stands accused of orchestrating the child's disappearance. 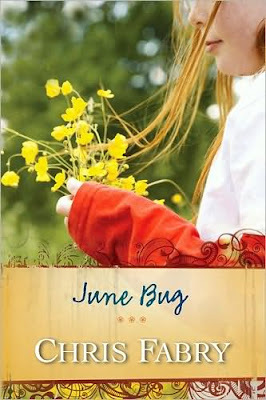 The answers to June Bug's questions lie in Dogwood, but does she really want to know the truth? Can she face the past John's been running from all these years? Does she truly want the things she craves if it means losing the father she loves? While June Bug sounds like a thriller, it really isn't. It does have mystery, a splash of suspense, and a few curves in the road, but mostly, it's a gentle tale about a girl and her dad. Themes of imperfection, salvation, sacrifice and devotion weave throughout the story. The mystery keeps things moving along, although at a canter more than a gallop. In fact, the story can be compared to an RV trip - meandering; smooth in some places, bumpy in others; more about the ride than the destination. Although it's longer than it needs to be, June Bug is very readable. The characters are not rounded enough - except for June Bug, she's pretty irresistible - but they're recognizable and for the most part, likable. All in all, June Bug's a nice read. It's clean, uplifting, and touching. Technically, I think it's classified as Christian fiction, and while there is a fair amount of God-talk, it's not over-the-top irritating. This is one of those sweet (but not sickening) books that make you realize how depressing your usual reading choices are. Put simply, it's a novel that makes you believe - in kindness, in forgiveness, in love and in redemption. June Bug's not perfect, but it still packs a wallop. A word of advice: Bring tissues. To the FTC, with love: I borrowed this one from the library on the recommendation of my friend over at Inside a Book. Thanks, Gaye! You're awesome. I'm glad you tried June Bug! You've certainly steered me to some real winners so it was about time that we shared! Your review was, as usual, incredible. I loved how you liked the story to the RV trip. That was perfect. I was impressed that although it wasn't the greatest book I've read,it was the right book for me at the right time. I've made that journey myself - that journey of discovering who I am! Let's see, what shall we read next?!? And We're Off ... to a Winning New Year!